Kill plenty of zombies starting in Back Alleys (city) then over a Draw Bridge, locating the Miltary Outpost to make your escape. This installation can be effected by old maps in the "left4dead2/maps" folder. Including any old deadcity addon files located in the "left4dead2/addons" folder. These old files can cause conflict with new Source Add-on Files (VPK). Automatically: Double Click on main "dc2lite.vpk", steam Application will let you know when it is installed. Manually: Copy & Paste "dc2lite.vpk", into your "left4dead2/addons" folder. 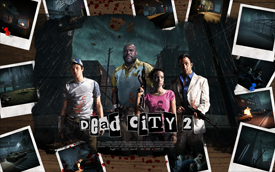 - Sure there are a couple of missing things, but this you can be sure of DEADCITY II LITE (Zombies will rule).